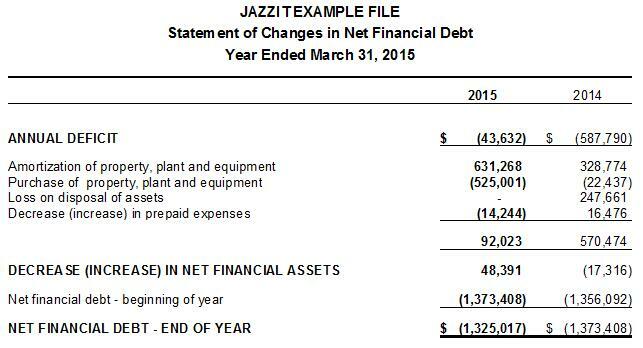 Jazzit’s 9 column financial statements include support for the Public Sector Accounting Board (PSAB) format. With a few quick steps, you will be ready to prepare and present financial statements in the PSAB format. Please note: You will need the templates of April 1,2016 (or newer) and accompanying styles in order for the 9 column financial statements to correctly display the PSAB presentation. The following article will outline how to activate the PSAB format in the Jazzit financial statements. The 9 column financial statements will need to be activated as the PSAB format is only available in this format. Activate the 9 column financial statements by clicking on the “Click to switch to 9 Column with totals format” button located in the admin section of the home menu. If you are already using the 9 column financial statements, you can ignore this step. Next, click on the ‘Client profile’ tab, and select PSAB from the ‘Structure’ dropdown. Selecting PSAB from the above dropdown, will automatically switch the Engagement Report, Balance Sheet and Income Statement to the appropriate presentation, and activate the Statement of Changes in Net Financial Assets. The Statement of Financial Position will by default display in the unclassified layout with items such as Inventory, Prepaid Expenses, and Tangible Capital Assets moving to the Non-Financial Assets section. The Accumulated Surplus reconciliation appears at the bottom of the Statement of Operations (only if the Statement of Changes in Accumulated Surplus is not used). The Statement of Accumulated Surplus (Deficit) allows you to reconcile any differences you may have in the Accumulated Surplus account. This also provides the functionality for prior period adjustments. The Statement of Changes in Net Financial Assets allows you to make any adjustments necessary to the surplus or deficit for that particular year. Changes can include purchases of property, increases in prepaid expenses during the year, or capitalized interest from investments.